The colleges also offer several scholarships and concession policies for meritorious students in the region. 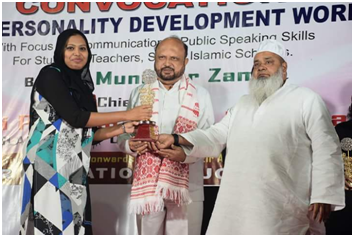 The colleges basically create a larger scope of woman education in the region especially towards the socially backward Muslim and other minority communities. The trust has emphasized women‘s education by establishing Maryam Ajmal Women’s College of Science & Technology and Maryam Ajmal College of Arts; to provide conducive and latest facilities of science education. Likewise the trust has also established Maryam Ajmal women colleges in 3 rural locations for promoting girls education. Maryam Ajmal Women’s College of Science & Technology is blossoming as the finest flower in the garden of Ajmal Foundation with its higher secondary section established in the year 2006. The college has come to symbolize the unwavering commitment of the Ajmal’s towards social reconstruction through modern science education on the one hand and their deep reverence of Ajmal Brothers to their beloved mother- late Maryam Un-Nisa Ajmal, whose memory they wish to perpetuate empowering women to be participants in the rapidly changing scenario of scientific and technological revolution sweeping the world today. With this vision and magnanimous struggle and hard work of many people was born Maryam Ajmal Women’s College of Science and Technology (Degree) on 16th July, 2012. It started its journey with affiliation from one of the most prestigious universities of Assam; i.e. Dibrugarh University. It began with only 44 students admitted to B.A and B.Sc courses and today we have more than 300 students studying in various major subjects like English, Assamese, Education, Chemistry, Zoology Botany, Physics and Political Science. To fulfill the needs of the masses we applied for major subjects like Mathematics and major in this subject will be offered from the coming session. Maryam Ajmal Women’s College of Arts, Hojai was established in the year 2011 under the aegis of Ajmal Foundation, to impart education in the field of Arts to the girl students of the North East India. After the establishment of Maryam Ajmal Women’s College of Science and technology, it was felt within the organization that the region is very much in need of an Arts College. A survey was conducted in the entire region and the feedback and recommendation suggested in favour of setting up an Arts College for girls of this region. The Ajmal family in no time took some immediate decisions in favour of setting up of the college. Thus the college came into existence. Maryam Ajmal Women’s College of Arts, Hojai is an institution with a difference. Besides assuring academic excellence, we value individualism, creativity and innovation and strive to nurture them in our students. Since its inception, the college has been doing wonderfully well with its results. The unconditional service rendered to the unprivileged girls has earned accolades from every corner of the society. The institution has the reputation of bringing about comprehensive change in the personality of the students who go on to get admission in such prestigious institutions like the Jamia Millia Islamia, Delhi with a dedicated deligent and caring staff. We are always at the service of the society.